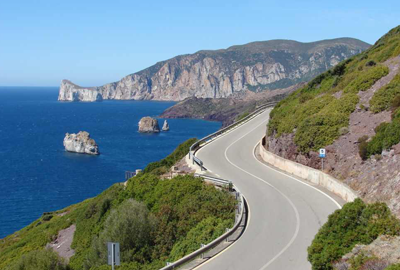 Sardinia motorcycle tour: the ultimate riding paradise ! 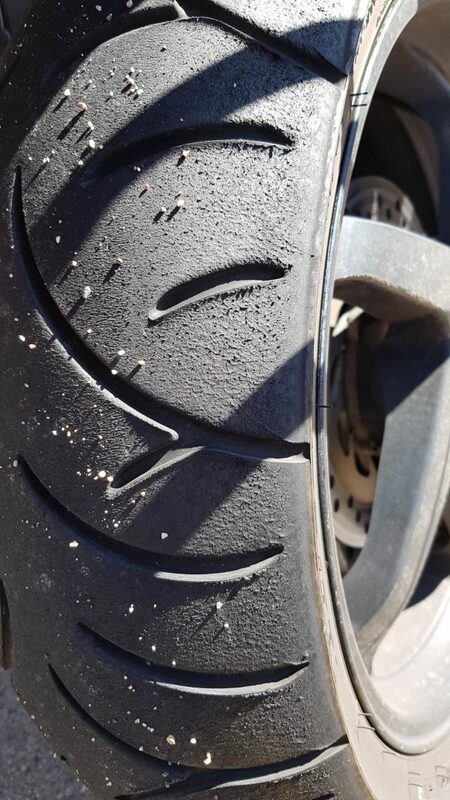 Sardinia, what is that ? The ultimate riding paradise!!! The name Sardinia is from the pre-Roman noun *s(a)rd-, later romanised as sardus (feminine sarda). It makes its first appearance on the Nora Stone, where the word Šrdn testifies to the name’s existence when the Phoenician merchants first arrived. According to Timaeus, one of Plato’s dialogues, Sardinia and its people as well might have been named after Sardò (Σαρδώ), a legendary woman born in Sardis (Σάρδεις), capital of the ancient Kingdom of Lydia. There has also been speculation that identifies the ancient Nuragic Sards with the Sherden, one of the Sea Peoples. 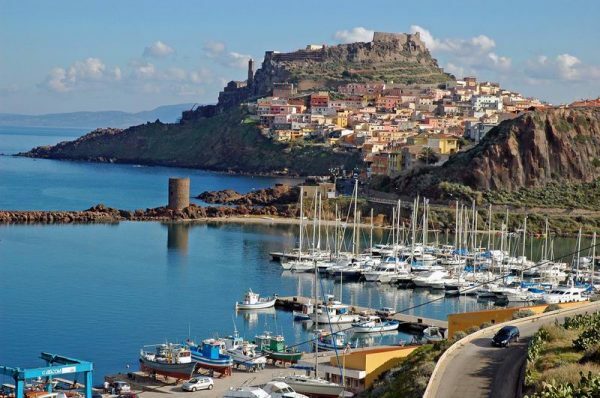 But, from our point of view, Sardinia is a big island with a small population in the middle of the Mediterranean sea reachable by ferry from Italy mainland in an overnight sail. Which means that if you do not have a lot of time but you want to ride in the ultimate motorcyclist’s play land, this is the trip for you! Riding these twisty roads is a roller coaster ride of excitement. 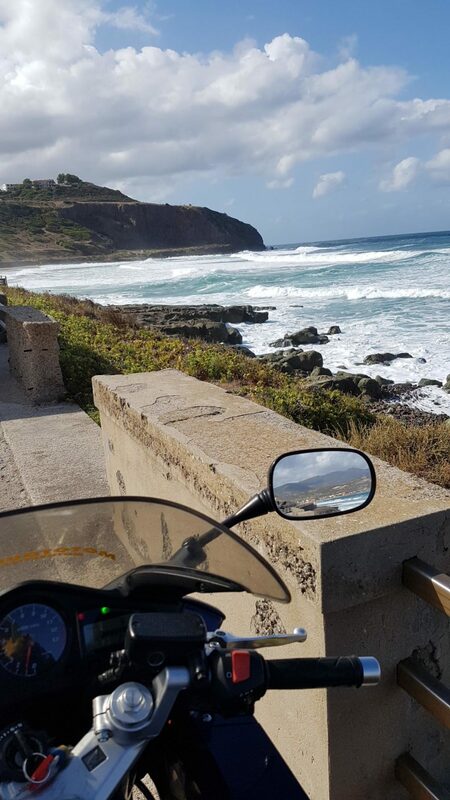 Our motorcycle tour takes us over mountain roads with spectacular curves with great road surface, along seaside cliffs and through the wilderness. 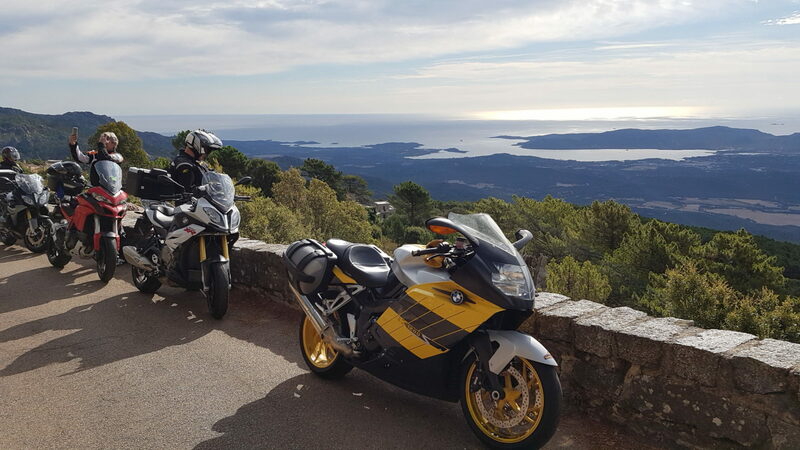 The dramatic views of the sea, roads running on high cliffs and mountain peaks will leave you astonished. Whether you enjoy cruising or knee-on-ground riding, there is something for everyone. 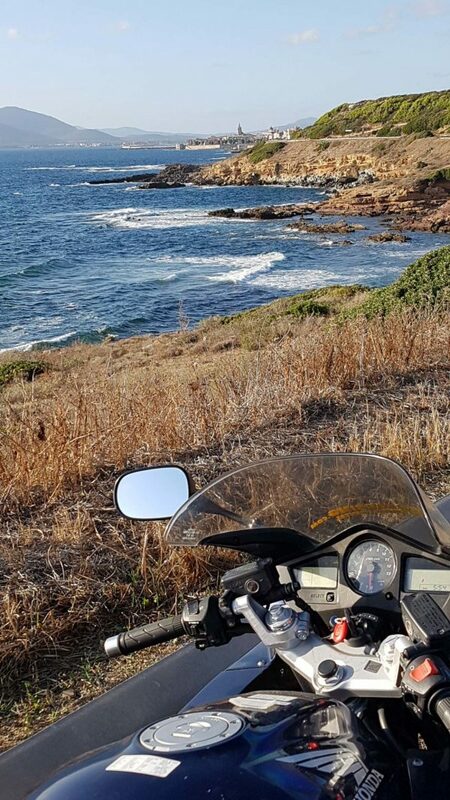 This motorcycle tour offers memorable views and unbeatable rides for either the racer or the cruiser motorcyclist. Day of meeting at the hotel in Milano, welcome dinner and briefing on the Italian traffic, rules and roads. Overnight in Milano. Arrival at 8:00 in Porto Torres and proceed to Alghero for our breakfast. After breakfast we’ll follow the coast to Bosa and inland toward Su Gologone. Our hotel for the next 2 nights is in the middle of this wonderful region. 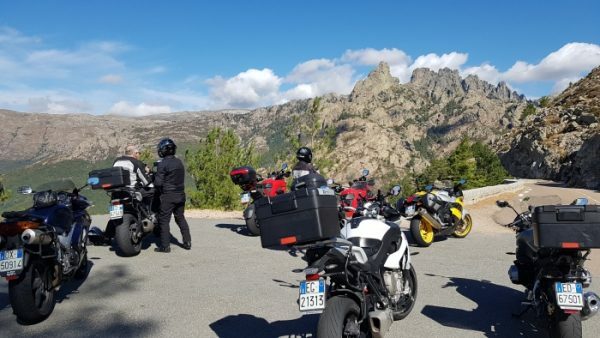 Day 4 – Wednesday – Day of fantastic riding in the Gennargentu region. Incredible twisties in the Gennargentu region, in the center of Sardinia, visiting ancient villages or if you prefer, relax at your hotel with a massage and an afternoon next to the swimming pool. Your choice! 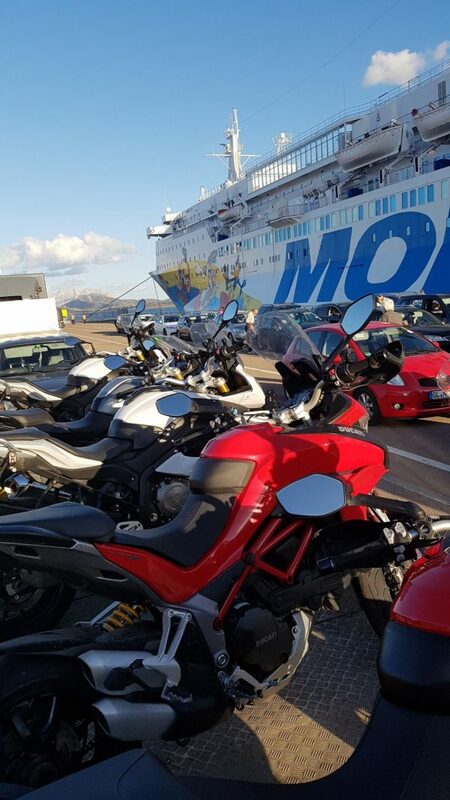 Morning departure to the Southern region of Sardinia heading to Cagliari following the wonderful road along the east coast of Sardinia. After Cagliari we will reach Pula in time for dinner and the overnight stay. From Pula to Capo Spartivento to Iglesias, Guspini passing Oristano ending our day near Bosa. Arrival in Genova, not touching the Autostrada and crossing the Appennini and the Pianura Padana we will make our way to Milano for the end of our journey. Delivery of the motorcycle to our depot, farewell dinner, and overnight at the hotel. Leisure time until the transfer to the airport for your connecting flight to your next destination. 3/4 star hotel accommodation in a double room, dinner and break­fast.